So it's been a few days since my last post and I feel good about the fact that I am not totally walking away from an idea. I don't care that it is not 100 % finalized, but I do like the fact that I have a concept: I want to create a narrative game based on Rube Goldberg mechanics that is built to raise awareness of a social issue. More and more I am liking the idea of virgin land. 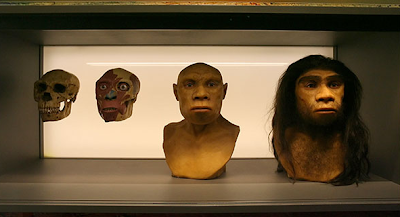 Today I read a great article in the Times about the man who re-creates human life forms - he is a paleo artist. He does all of the work for the Museum of Natural History. I am not sure if this relates at all to my thesis other than the fact that the work he creates is truly the intersection of what art can do for science. I want my project to be able to communicate an emerging scientific issue, show how human interaction created this problem, and show the results of the problem. I don't think that I want the problem to be solved in a game scenario because in reality- this is a problem that doesn't have a solution. What I can provide however, is a new awareness about this issue through game play. Audience? I need to research that. On a sidenote I just started working at Sesame Workshop. The environment is truly amazing. I am working in the international division and am specifically focused on creating interactive and sometimes mobile educational material and content for english language programs in Asia. I could not be more excited. So far I just designed a teachers resource packet and collateral material (including an Elmo paper puppet that you put together with popsicle sticks!). The team that I am working with is very into making quick and dirty prototypes of things which I think is really good for me to see. It is comforting to know that you can just get an idea out there sometimes without being really judged. BUT... at the same time I do feel like when I create a dirty prototype in a work environment, and even to an extent at school people are judging the look of the product. I don't really know what to say about that other than I think it's a comfort thing that I just need to get over.